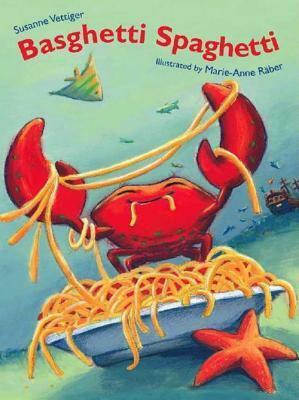 Oscar the crab loved spaghetti so much he even made up a song about spaghetti. But whenever Oscar got nervous he mixed up the letters in the words he was trying to say, so when he tried to teach his classmates his song about spaghetti it came out ‘basghetti’. Everyone laughed at him and Oscar ran away. He met an octopus who lived in an old pirate ship. This octopus was also a speech doctor who worked with Oscar to help him overcome his nervousness when talking to others. He played games and learned tongue twisters. Soon Oscar was ready to go back to school. Everyone was so happy to have him back, they had a huge spaghetti party to celebrate. Oscar was so proud of himself that he taught them all his special spaghetti song. And this time he sang every word correctly – except for basghetti! 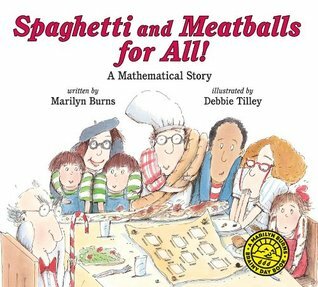 This hilarious math book is more about area and perimeter than it is about the spaghetti and meatballs. When Mr. and Mrs. Comfort invite their whole family (and the neighbors) to dinner they prepare everything for 32 people. Mr. Comfort is in charge of the cooking and Mrs. Comfort is in charge of the seating. So she plans on eight tables with four chairs each to seat everyone comfortably. But as the guests start arriving, they push some of the tables together so they can sit in larger groups, the only problem is that when two tables of four are pushed together there is only enough room for six chairs, not eight. This continues until finally someone suggests that they separate the tables again as Mrs. Comfort had planned and everyone is served spaghetti and meatballs. Catrina the cat cannot wait for the family to leave the house. She paces the floor and even refuses her breakfast. Finally, everyone is gone and the fun begins! It’s Wednesday, which means spaghetti. Caterina and her friends gather to cook up a spaghetti feast. They party until the school bus arrives at 3:00, then everyone leaves taking the leftovers home with them. Caterina refuses her dinner as well, because tomorrow is guacamole day. Daddy picks up Cory from day care and they go to the grocery store to pick up something for dinner. 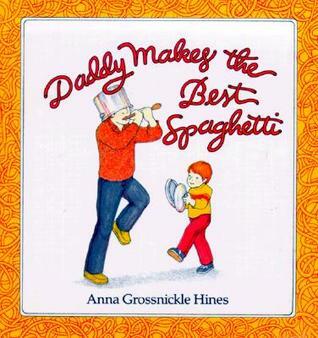 It’s Cory’s choice and he chooses spaghetti, because his daddy makes the best spaghetti in the world. At home, Cory helps wash the vegetables and set the table. When Mommy gets home they eat dinner and Cory helps her wash the dishes. Then it’s time for a bath and a bedtime story. Goodnight Cory!